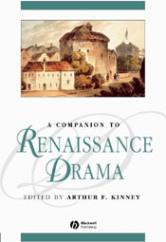 This expansive, inter-disciplinary guide to Renaissance plays and the world they played to gives readers a colorful overview of England's great dramatic age. Provides an expansive and inter-disciplinary approach to Renaissance plays and the world they played to. Offers a colourful and comprehensive overview of the material conditions of England's most important dramatic period. Gives readers facts and data along with up-to-date interpretation of the plays. Looks at the drama in terms of its cultural agency, its collaborative nature, and its ideological complexity.